"The old man lay crumpled on the flagstones in front of a Park Avenue brownstone, his lifeblood oozing from five small holes in his neatly buttoned tweed vest like sap from a maple tree tapped in spring." 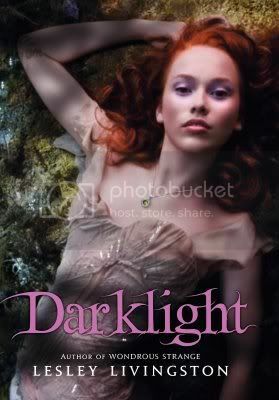 This sequel to Wondrous Strange picks up with struggling New York teen actress Kelley Winslow coping with her newly discovered fairy heritage. Her relationship with changeling member of the Janus Guard, Sonny Flannery, is on hold as he seeks out the supernatural Hunters who are linked to dangerous Queen Mabh. Kelley is working on a production of Romeo and Juliet, and there are a few parallels to her relationship with Sonny, who is aligned with a competing clan of fairy folk. While Sonny is away he grows increasingly jealous of fellow Janus Guard Fennrys, whom he'd specifically asked to watch over Kelley while he was gone. While Shakespeare aficionados will see a lot of allegory in this story, a knowledge of the classics isn't necessary. Any reader of YA fantasy will find lots here to enjoy: magic, action, romance. This sequel has many Romeo and Juliet references, and because it's so closely tied to the previous book, plenty of references to characters and events from A Midsummer Night's Dream as well. The creepiest addition were the leprechauns, who unlike the diminutive fun-loving tricksters of legend, tend to be compulsive drinkers (even slurping spilled booze out of the mud, if necessary) and prone to violence. They are described as exceptionally lanky, wearing distinctive boots, mean-looking and evil-tempered. Definitely not the sort you'd want to run into in a dark alley. By the end of the story, Kelley discovers she has the rarest of all gifts among fairies... she is able to lie. Most of the fey get around this with careful use of language. Kelley and Sonny each feel that they are endangering each other, and therefore "must" protect each other by staying apart. Readers may find Kelley's immaturity trying at times, but failure to communicate between lead characters is a common trope in plenty of YA novels. The lack of communication between Kelley and Sonny leads to their apparent break-up by the end of the novel.